Knitting Machines For Home Knitting - What is the best knitting machine to buy? Knitting Machines - What is the best knitting machine to buy? I've been looking around for a home machine, but so far I haven't come to the conclusion yet. The more I look around, the more confused I get. The best advice I can give you right now is to take your time and do your research. Pick a few machines that fit your priority. Then compare them one by one. Check to make sure if the machine you're going to buy will have part available in the future or will it discontinue in a short time. You may want to check out second hand machines as well. What types of Knitting Machines are best for home use? 1. Why do you need knitting machine? 2. What gauge machine are you looking for? 3. How much are you willing to pay for it? There are many types of knitting machines you can choose from these days. The most familiar ones are Artisan, Silver Reed, Passap, Singer, Brother and Bond Knitting Machines. Their prices are ranking from under 20 dollars to up to thousand of dollars. There are manual machines and automatic machines available. CARON-The Ultimate Knitting Machine. Imagine knitting 1200 stitches a minute! With this machine you can! It is so fast you can make an adult sweater or afghan in two evenings or a child's sweater in one evening. It accepts yarns from sport to chunky. Best of all; no knitting experience is needed. 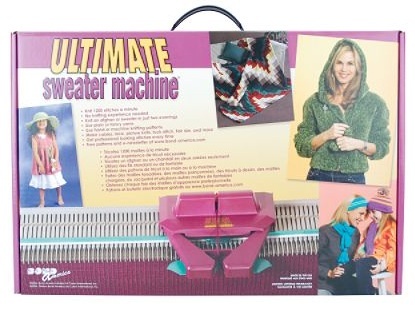 This machine is compatible with hand knitting patterns as well as ultimate knitting books. Machine is capable of making cables; lace; picture knits; tuck stitch; Fair Isle and many other fancy stitches. Machine has six key-plate to match every size knitting needle from 6 to 10-1/2. Make an afghan or sweater up to 100 stitches across or you can add in some extension kits or add another Ultimate Knitting Machine for an even longer reach. A detailed instructional video is included with every machine on all basic stitches and fancy stitches. Packed in a convenient colorful carry box and weighs only 10 lb. A limited manufacturers warranty is included. Made in USA. Price : $120 and up. Same as LC560 except that you can plug in the PE1 Pattern Controller to LC580 for use on for Standard Gauge 4.5mm Electronic Knitting Machines - Silver, Studio, Singer, Knitmaster. I enjoy knitting on the machine but I prefer knitting by hand even more. I use my sewing machine more often than I do with knitting machine. I can’t move around or take the knitting machine with me the way I take my knitting needle. The Bond USM is not an automatic machine and it needs a lot of hand manipulation, but it help shorten a lot the knitting time compare to the hand knit. I used to have the machine out in the kitchen table when the girls weren't born yet, but due to limited space I have to take the machine down and now it’s lying under my bed! I knit a pretty intrasia sweater for my mother-in-law using Bond USM and she loved it. She passed away 5 years ago and I don’t quite know what happen to the sweater. Before deciding which machine you want to buy, you should do some researches. Don’t make a decision right away. Read reviews, ask questions, or joint the machine knitting discussion groups. This will help you what knitting machine is the right one for you. Good luck with your finding. You can read more reviews about knitting machines at Amazon.com by clicking on link below. I will add more links when I find more. Have hundred of links to machine and hand knit resources & more. Do You Have Any Advise Or Comment Regarding Knitting Machines? Share it! Tell us about your knitting machine. Love it or hate it? What Other Visitors Have Said About Knitting Machines.